A special Catalyst Meter-Dispenser specifically designed for the plastics industry. It eliminates the hazard and labor of pouring small quantities of catalyst accurately, reduces catalyst spillage to the vanishing point. Easy to read and set, it always delivers the exact quantity desired. 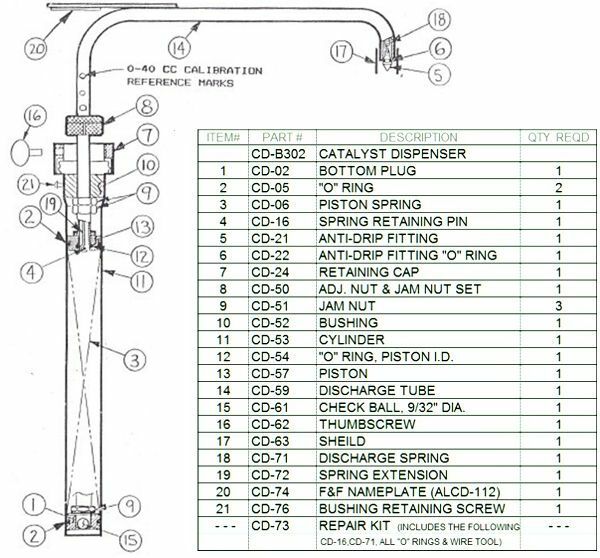 The Catalyst Meter-Dispenser saves catalyst, saves resin and saves labor wasted with wrong mixes. 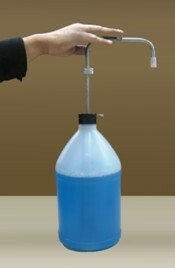 DISPENSER fits standard 1-gallon pollyethylene shipping bottle. ANTI-DRIP valve at the discharge stops dripping. MATERIALS used are non-reactive to catalyst. QUANTITY is easily set (and locked, if desired). Range per stroke is 1 to 40 cc. PRESSURE on the top knob delivers catalyst in a well-controlled stream.